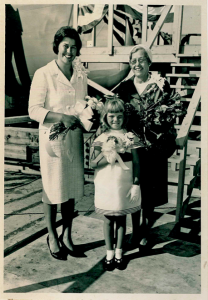 When young Susan stood proudly by as maid of honor as her mother, Eleanor Ring, christened the second USS Coronado (LPD/AGF-11) in 1966, she was unaware that more than five decades later she would be cracking a bottle of bubbly across the bow of the U.S. Navy’s newest USS Coronado (LCS 4). The honor of christening a ship in the U.S. Navy is given to the ship’s chosen sponsor. 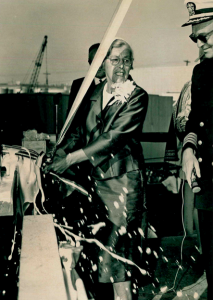 In a time-honored tradition, every ship ever launched by the Navy has been assigned and christened by a female sponsor. In 2011, the Navy selected Coronado native Susan Keith as the sponsor for the third ship eponymous with the island. Her family’s vibrant and longstanding history of naval service and Keith’s dedication to the ship’s namesake city made the Navy’s decision a wise one. Keith was born in Coronado to Eleanor and Vice Adm. Stanhope Ring. Both of her grandfathers, both of her uncles, and her father were all Naval officers, but her father is lauded as one of the nation’s most distinguished; he was awarded the Navy Cross after commanding the USS Hornet’s Air Wing in the Battle of Midway. Her godfather and later stepfather, Rear Adm. Putnam Storrs, was one of the Three Seahawks, the predecessor to the Blue Angels. Her two brothers also joined the naval services, and Keith has been a Navy wife and Navy mother. But her involvement doesn’t stop with the Navy. Over her lifetime, Keith has become an integral part of the Coronado community (following the respected footprints of her grandmother and mother). She has served with numerous volunteer organizations including the Coronado Floral Association, Crown Garden Club, MainStreet, Navy League, Library Board of Trustees, Friends of the Library, Planning Commission and the Historic Resource Commission. Further, she has served as the president and later board member of the Coronado Historical Association and as an elected member of the Coronado City Council. Because their sponsor is so deeply committed to both the Navy and the Coronado community, the crew of the USS Coronado will have the unique benefit of being enveloped into the Crown City family. From the sound of it — the crew is the lucky party. Keith said, “I think of them as family members.” To Keith, that means bringing them Valentines, cookies, and Halloween candy, and even inviting them to her annual Fourth of July party. “I make sure everybody knows the crew is here so they feel welcomed and a part of the community — because they are! They bring their wives and kids and we all celebrate together as family,” she said. The size of the new USS Coronado, which is being commissioned at North Island on April 5, lends itself well to a family feel. It is manned by two crews — the Gold crew and Blue crew — of only 40 each (eight officers and 32 enlisted). The crews switch off operating the ship and are flown to the ship’s location, allowing it to remain at sea or at far-off ports. 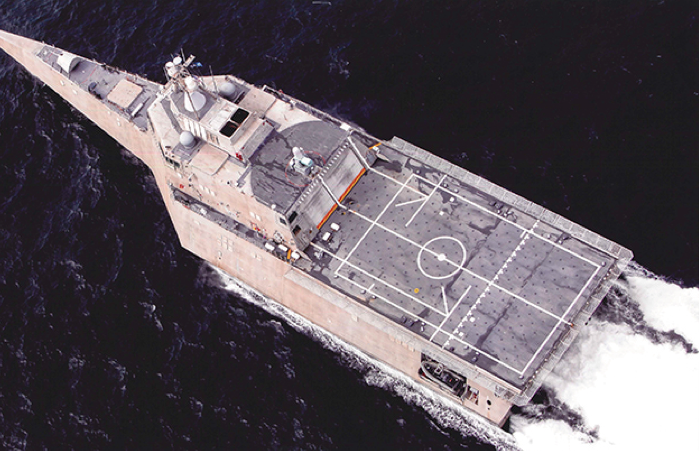 But don’t let the size fool you — the USS Coronado (appropriately called the “Crown of the Fleet”) is small but mighty. It’s a state-of-the-art, highly advanced battleship, designed to be fast (its aluminum construction and lack of paint keep it lightweight), and able to patrol close to shore (LCS stands for “littoral [coastal] combat ship” so it has no propellers but rather “thrusters” that allow it to get as shallow as 14.4 feet). It can sniff out mine warfare and submarines, and still have the capability to attack other ships. Keith said one commanding officer calls it a “400 foot jet ski that turns on a dime.” It’s one of two prototypes that were constructed — her sister ship, the USS Independence, which is currently just over the bridge, has encountered some problems that have been remedied in the USS Coronado. Like Coronado itself, it’s small, but it’s world-class. Keith hopes, and is confident, that Coronado gives its third namesake ship the same warm welcome that she received in Mobile. 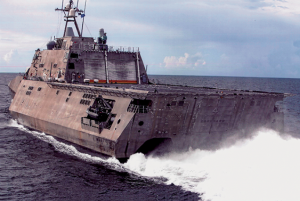 The USS Coronado and its crew, which left on Jan. 27 to sail to Mayport, Fla., for helicopter testing and training, is currently making its way through several port stops and will arrive in the San Diego bay to port at 32nd Street around the second week in March. Keith said, “It would be so lovely to welcome her on the bay with flags.” On March 28, the ship will go out to sea for some photo ops with Coronado in the background, return to tie up at North Island and wait there for the big commissioning celebration week to commence. And Coronado won’t disappoint when it comes to a patriotic celebration. The Coronado Men’s Golf Club will host a golf tournament, Rotary Club of Coronado will host the crew at its Wednesday luncheon, Coronado Brewing Company will release a new libation named after the USS Coronado, and the Coronado Arts Commission has organized a poster contest open to all Coronado school-age children (the grand prize winner will present his or her poster to the ship at the ceremony). The commissioning ceremony itself, which is expected to draw around 4,000 people, is free to the public, but anyone interested in attending must order a ticket. (Tickets can be obtained at www.coronadocommissioning.net.) The Navy does not pay for any part of the commissioning celebration, so all funds must be raised through donations. The goal is $150,000, which pays for a reception for the commanding officers, breakfast before the commissioning, a public reception held on the pier, a gift from the city to the ship, and plaques for donors and crew members. Any surplus money is given to the crew to be used in any manner they wish. Donations are tax deductible and can be made at www.coronadocommissioning.net. 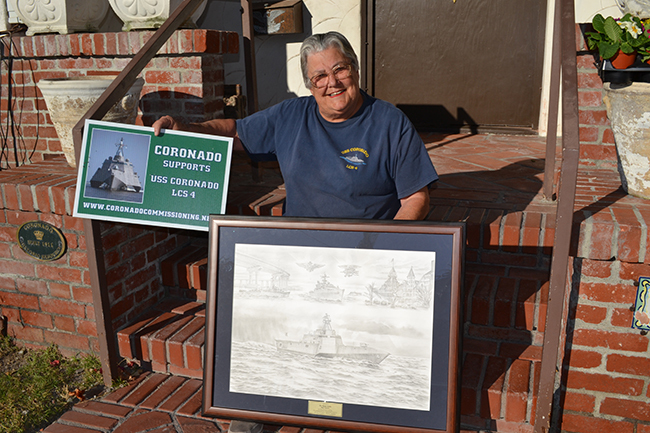 Limited edition yard signs welcoming USS Coronado are available at Coronado Historical Association’s Museum Store for a $20 donation. Aluminum construction and lack of paint keep the USS Coronado lightweight. With thrusters instead of propellers, the ship can get into shallow waters and dispatch small boats. Ship Sponsor Susan Keith displays a model of the USS Coronado. The Ring family (Susan Keith, left) celebrates the christening of the second USS Coronado. Eleanor Ring cracks the champagne on the USS Coronado (LPD/AGF-11) in 1966. The state-of-the-art ship, which includes a helicopter landing pad, will arrive in San Diego mid-March. 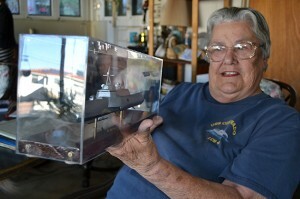 Keith displays her collection of USS Coronado memorabilia, including a plaque available at the Coronado Historical Association. 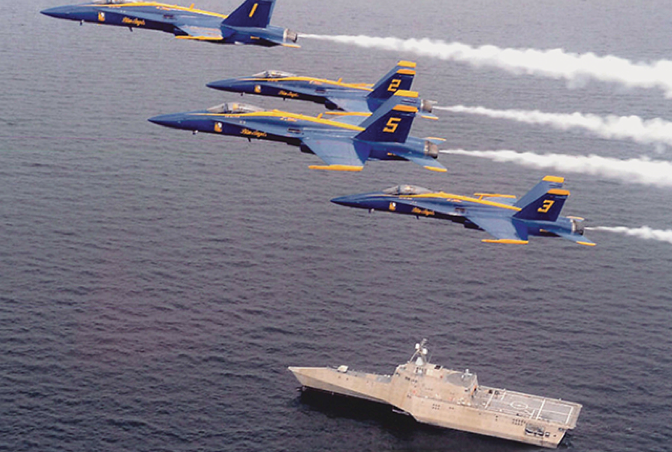 The Blue Angels help celebrate the launching of the USS Coronado.